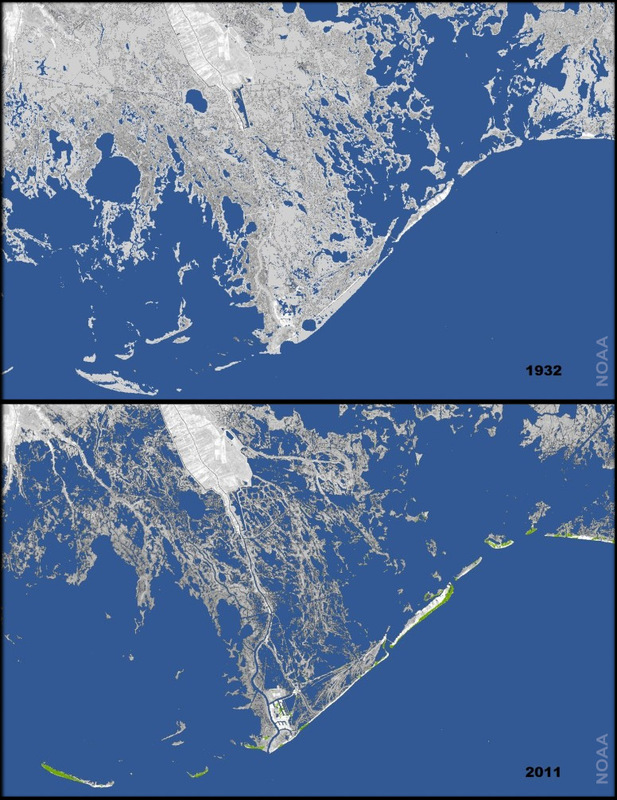 Across coastal Louisiana, the Gulf of Mexico has swallowed hundreds of thousands of acres of land in the last century. In Terrebonne Parish, more than 192,700 acres were lost from 1932 to 2010. According to Louisiana’s Coastal Master Plan, if we do nothing more than we have done to date, our expected annual damages from flooding by 2061 would be almost ten times greater than they are today, from a coast-wide total of approximately $2.4 billion to $23.4 billion. Louisiana’s current coastal threats are shared with growing numbers of similar communities across the United States. These include the Miami metropolitan area, the Norfolk, Virginia area, and parts of Washington State and Alaska. Isle de Jean Charles has lost 98% of its land since 1955. They recently received a grant to support their relocation. Through the Isle de Jean Charles resettlement we hope to create a replicable model that will guide communities in other important yet vulnerable regions through similar resettlement efforts in future years. Creating a model for incorporating traditional ecological knowledge into coastal restoration decision-making. In 2013 members of the Lowlander Center worked on a project designed to gather vital information for coastal restoration efforts while working to bridge the gap between academic science and traditional ecological knowledge. The project translated traditional ecological knowledge into scientific models that can be used alongside other scientific data sets. In the short term this project allows for the incorporation of traditional knowledge into the data sets used by coastal restoration decision makers. In the long term it offers a road-map to begin the work of bridging gaps in communication between scientists and those with local and traditional knowledge. You can read scholarly articles detailing this work here and here.